A detailed travel guide about Chicago. Read the recommendations about the restaurants, attractions, shopping spots and accommodation options in Chicago. Chicago, also known as the Windy City, is the sparkling jewel of the Midwest. Due to its location in the middle of America it has the frenetic pace of a big city with the small town charm and friendly openness one expects of native Midwesterners. 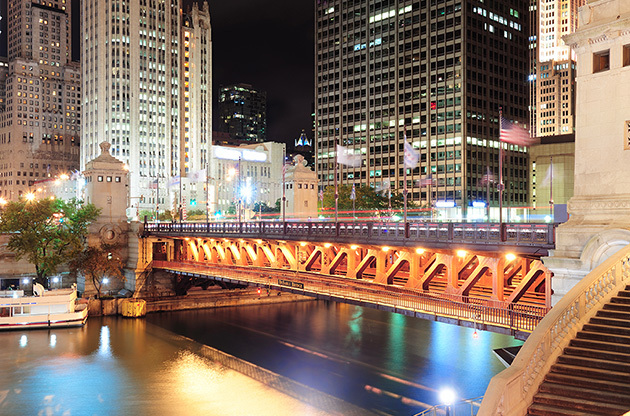 When you arrive in Chicago for the first time, you are immediately taken in by the visual appeal of the city. Its architectural importance in the US has given it some of the most beautiful and unique buildings in the world. It is a city that values the arts and that is evident from the pieces of sculpture found on nearly every block. The sights and sounds of Chicago are unlike any other place on the planet. The elevated trains – or El trains – buzz and chug along their tracks, carrying this city's citizens to every corner of the city along its appointed rounds, air brakes screeching as it makes yet another stop. Street musicians play drums, saxophones and guitarists serenade folks as they pass by. The smells of the city are sharp in the air, the unmistakable aroma of pizza, wood smoke and commerce blending in a pleasant mélange. After a long day of business conferences and meetings, head out and see what this amazing place offers. You will come away having experienced the best of the Midwest. Chicago is located in the upper northeast corner of Illinois, bordering the state of Indiana. It lies along the southern shores of Lake Michigan, one of the five Great Lakes of Michigan. International visitors to the Windy City usually arrive at the city's O’Hare International Airport. The airport is located 17 miles north of the downtown area. Domestic travelers will either fly into O’Hare or Chicago Midway International Airport which is located ten miles outside the downtown area. While some international visitors fly in to Midway, the airport mostly caters to economy domestic carriers. This fascinating city offers a little something for everyone in attractions and exciting things to do. In summer, the locals and tourists alike flock to the beaches along Lake Michigan to catch some rays and take a dip in the chilly waters of the lake. Lake Michigan also offers many jogging and biking trails for outdoor lovers to get some exercise as well as catch sight of the beautiful Chicago skyline. The Field Museum of Natural History has amazing dinosaurs and other natural wonders of the US, with permanent displays as well as traveling exhibits. Art lovers must visit the Art Institute of Chicago, with an impressive collection of American art, impressionist and post-impressionist works by some of the most famous names in the art world. And no one can visit this city without stopping by Shedd Aquarium, with its amazing displays of underwater life from all over the planet. The Lincoln Park Zoo and the Brookfield Zoo are two wonderful places to while away an afternoon, with their animal habitats and awesome collections of reptiles, mammals and birds from the world over. The Lincoln Park Conservatory, Morton Arboretum and Chicago Botanic Gardens will appeal to lovers of nature, with their collections of flora from every corner of the globe. Theater and dance lovers will enjoy catching performances by Joffrey Ballet, the Chicago Symphony Orchestra or the Shakespeare Theater. Second City Comedy Troupe, a world famous improvisation group where many of Saturday Night Lives most famous alumni cut their comedy teeth offers shows seven nights a week to tickle your funny bone. And catch a great musical performance by one of the hot performers of the day at the Chicago House of Blues. When the locals think about shopping in Chicago, three words immediately come to mind: the Magnificent Mile. This strip of shops, department stores and specialty designer boutiques draws shoppers from all over the world. The top five department stores in America are located on the Mile: Bloomingdales, Nordstrom, Saks, Neiman Marcus and Macy’s. Designer names such as Prada, Gucci, Giorgio Armani and Louis Vuitton all boast exclusive boutiques in this famed shopping district, offering world class designs to a list of the who’s who in the city. There are also antique galleries, pet boutiques, toy stores, shoe stores and sporting goods stores as well as multi-storied shopping malls, all within this glorious mile. Harry Caray’s Tavern, located on the Navy Pier, is a restaurant, bar and sports museum all wrapped up into one. This icon of the city has an extensive menu and a fun, rowdy but family friendly atmosphere. Grab a burger and a pint at Harry Caray’s while watching sports on one of the big screen televisions. Uno Chicago Grill is the birthplace of the famous Chicago style deep dish pizza. Their towering, thick monstrosity sized pizzas are made with the freshest ingredients and their friendly staff takes the pizza business seriously – but they like to have a lot of fun as well. For a real slice of the city's history, Uno Chicago Grill is the place to go. When Chicagoans want steak they know exactly where to go – Benny’s Chop House. They specializes in Midwestern comfort cuisine, making this a can’t miss culinary experience for out of towners. Bev Chicago is the place to see and be seen and is frequented by the many celebrities who call the Windy City home. With great music and a diverse wine, beer and cocktails list, the party never ends at The Apartment. For a more sophisticated good time head to Crimson Lounge, with its Victorian feel and gothic mood lighting, this is a club that is more intimate and offers a good time for a slightly more refined crowd. Seadog Chicago is a unique tour experience. Departing from the Navy Pier, these seventy-five minute boat rides take you through the Chicago Locks all the way to the Chicago River where you will get an amazing view of the Chicago skyline and all of its unique architecturally important buildings. The Pedway is a series of walkways, passages and tunnels that allow for underground exploration of Chicago all year round. Comedian Margaret Hicks leads this funny and entertaining 90-minute tour in a place even most natives of the city are unaware of. This wildly popular tour takes you to the sites of many haunted attractions and typically unseen locales that are important in Chicagoland’s gangster history of the 1930s and 1940s. See places like the site of the Valentine’s Day Massacre, as well as the purportedly haunted stretch of road that is the (un)resting place of Resurrection Mary, the most famous Chicago ghost. Located in the middle of America, Chicago is an easily accessible city having a beautiful nature and colorful and dynamic urban life. Being an ideal destination for sector leading global events like tradeshows, fairs, exhibitions, congresses, conferences and symposiums, Chicago hosts numerous world class meetings each year.